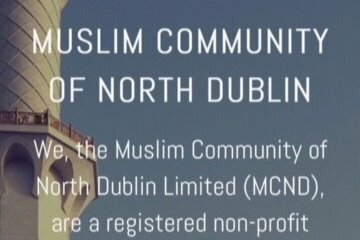 The Muslim Community of North Dublin (MCND) is a voluntary registered non-profit making charity in Ireland that organises various activities for the Muslim community. These include the five daily congregational prayers, the Friday prayer for the Muslim community, Qur’an lessons and religious studies as well as various social and cultural activities for the youth and adults. We are currently renting a sports hall for Friday prayer and utilising a small prayer room for our activities, which is not capable of meeting the demand of our growing community, particularly for women and children. The objective of this campaign is to raise sufficient funds to secure a permanent place for the establishment of a mosque in the area. Please support the future of the Muslim community in Dublin. In this blessed month of Ramadan, when rewards are multiplied, what better way to seek Allah’s pleasure then helping to establish a mosque for His sake. The Prophet, peace be upon him reminded us that “whoever builds a mosque for Allah then He will build for him a house like it in Paradise”. مع زيادة عدد المسلمين أصبح المصلى الحالي لا يسع المصلين. وما نقص مال من صدقة وخاصة في هذا الشهر المبارك. The funds will be used directly to build the mosque. As the money is going directly to the charity’s account, the directors will be responsible for the funds distribution .